There are now more bike racks* in Downtown than ever before! 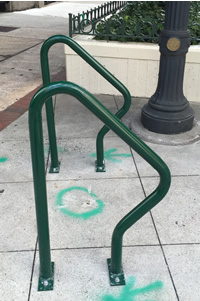 This week, CAP/ADID installed a total of 23 bike racks in 8 different locations around town. -Jimmy John's on Broad St. The racks are another reason why it's great to be on two wheels and to Be Downtown. With cycle tracks under construction, bicycle infrastructure and alternative transportation options in Downtown continue to grow. *CAP/ADID purchased the installed racks through the Atlanta Bicycle Coalition's partnership with Dero, which enables some proceeds of the purchase to support advocacy efforts in the Atlanta area.